Before using any of the following guaranteed delivery services, please call our Customer Service Department to verify the availability of your choice of delivery option. To assess the cost of this service, add a 7.50$ surcharge per shipment to the published regular express 5:00 pm rate. To assess the cost of this service, add a 10$ surcharge per piece to the published regular express 5:00 pm rate. Add a 35$ minimum surcharge per piece to the published regular express 5:00 pm rate. Add a 25$ surcharge per piece to the published regular express 5:00 pm rate. * Satisfaction on all guaranteed delivery services, or money back. This service offers you a delivery on the next business day by 5:00 PM. When cost is an issue and your shipment must be delivered quickly, this is your option. Our most economical delivery option offers you reliability for routine shipments to all addresses across Canada. 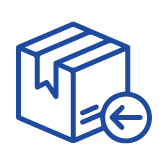 This service allows you the opportunity to receive documents and parcels from your Canadian partners and have the shipping costs billed directly to your account.